Shrouded in secrecy, "intelligence officer training" conflicts with universities' commitment to openness and free inquiry. The CIA-off-campus protests of the 1980s may need to be revived–this time addressed to President Obama. The administration has asked Congress to establish a new “intelligence officer training program” at colleges and universities. 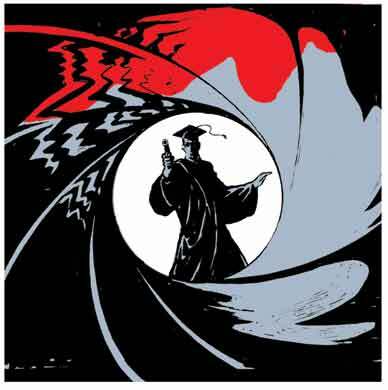 The proposal, buried in the 2010 intelligence authorization bill, would invite schools to apply for grants for courses that would “meet the needs of the intelligence community.” Students taking the courses would have to receive security clearances, according to Walter Pincus of the Washington Post, and their participation would be kept secret. After graduating, they would be required to work for the CIA or another intelligence agency. Under Obama’s proposal, interested students would have to apply to the director of national intelligence for admittance to the program. Selected students would get money, including not only tuition and funds for books but also a monthly stipend and travel expenses. We’re not talking about federal Pell Grants here; this money would come from the Pat Roberts Intelligence Scholars Program and would include paid internships at the CIA or other intelligence agencies. Students receiving financial aid, according to Pincus, “would be obligated to serve” at the CIA or another intelligence agency “for the same length of time as they received their subsidy.” The CIA, of course, is the agency whose use of torture has just been documented in sickening detail by an official report. Defenders say that’s all in the past, but Obama’s CIA director, Leon Panetta, opposes a Justice Department investigation of the torturers. The bill with the CIA-on-campus program was approved by the Senate Intelligence Committee on July 16 and is awaiting approval by Congress. Remarkably, committee debate did not touch on the new campus program but instead focused on CIA oversight and failures of agency reporting to Congress. What kinds of courses would the program pay for? One might hope they would include careful study of the Geneva Conventions prohibiting torture. Required reading should also include Legacy of Ashes, the award-winning history of the CIA written by Tim Weiner, who details its dismal track record, including failure to predict the 1979 Iranian Revolution and the collapse of the Soviet Union, not to mention the claim that Saddam Hussein possessed weapons of mass destruction. And let’s not forget 9/11, when the CIA waited until too late to inform the FBI about two of the terrorists who would become hijackers. You might conclude from these blunders that the agency needs people with better training. That indeed is the argument in favor of the CIA-on-campus program. But it was precisely in the days when Harvard, Yale and Princeton men ran the agency that it failed so miserably at providing “intelligence.” Apparently an Ivy League education is not the solution to the CIA’s problems. According to the bill, the new program will teach “analytic, scientific, technical, or other skills necessary to meet the needs of the intelligence community.” That’s pretty vague. The program will also provide grants to faculty members for research that meets their “current or emerging needs.” In the past, faculty who did research for the CIA were required to get security clearances and sign lifetime secrecy agreements–a problem for those who believe in openness and free inquiry. I found one exception among administrators: Harvard College dean Evelynn Hammonds, a historian of science, said she had not heard about the proposal, but “from what you described this has some real problems associated with it. It reminds me of when graduate students in the sciences worked on issues that touched on security and weapons programs.” The Princeton director of media relations said president Shirley Tilghman would have no comment because “this legislation is in proposal form.” Yale’s deputy director of public affairs made the same argument. But wouldn’t that be the best time for a university president to express concern and seek changes–before legislation was passed? The new program will incorporate an already existing one, the Intelligence Community Centers of Academic Excellence, which has trained about 650 students at ten universities in the past four years, including Norfolk State; Florida International; the University of Texas, Pan American; and Cal State, San Bernardino. That program isn’t exactly rigorous. At Cal State, Long Beach, it claims to emphasize “national security, intelligence, foreign area studies, language proficiency, geographical expertise and related competencies.” In fact, it’s an extension of the minor in geography. Eight courses are required, including Map Interpretation and Analysis, and Physical Geography. So it teaches students how to find Waziristan on a map, but it doesn’t teach them to speak Pashto or understand Pashtun politics, much less to infiltrate Taliban groups there. The Long Beach website says, “Completing the course of study does not obligate the student to apply for, or accept, employment with the U.S. Intelligence Community”–which may be the best solution for all concerned. What’s wrong with the CIA is not going to be fixed by training undergrads to work for the agency. And bringing CIA secrecy on campus is only going to undermine the university’s principles.